4 x CHURCHILL PORTS OF CALL CHARLESTON CREAM by JEFF BANKS MUGS. Charleston Cream mugs by Jeff Banks for Churchill China. 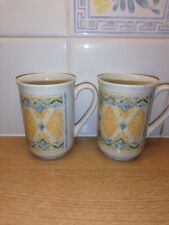 HERAT SET OF 4 MUGS. Collectable 4 x Mugs featuring the vibrant Herat design. CHURCHILL POTTERY. PORTS OF CALL BY JEFF BANKS, LONDON. Impressed marked - see photo. Stoneware by Churchill. Jeff Banks Ports of Call mug. I believe it’s in the Twist pattern. Very good condition. Slight gap in chicken wire in one place which I have shown on one of photos. Six Jeff Banks Orbit embossed porcelain cups and saucers. All are unused and in excellent condition. They look and feel brand new. Sorry UK mainland postage only. New: Jeff Banks , Orbit Embossed , White Tea Cup & Saucer, Porcelain. Stunning. New: 2 X Jeff Banks , Orbit Embossed , Saucers , Porcelain. 15.5 Cm Diameter. BEAUTIFUL COFFEE SET DESIGNED BY JEFF BANKS AT DEBENHAM. ALL IN IMMACULATE CONDITION. BONE CHINA IN WHITE WITH SILVER LINE DETAIL. PICK UP ONLY DUE TO COST OF SENDING AND VERY DELICATE. New: 2 X Jeff Banks , Orbit Embossed , White Tea Cup & Saucer, Porcelain. 2 X Jeff Banks Porcelain Orbit Embossed Cup and Saucer. Stephen from. Small mug with the Herat design. Churchill Ports of Call stamp underneath. Approx 8.5cm (3.5") high. Perfect condition. Motion by Jeff Banks London. Single porcelain coffee/tea mug.